Def Leppard singer Joe Elliott paid tribute to Lemmy from Motorhead last night on his weekly radio show. Lemmy Kilmister died after having major health issues for a couple of years on 28th December. Motorhead released their first album only a few weeks before Def Leppard formed in 1977 and went on to release 22 studio albums. During his first radio show of 2016 Joe played 'Sympathy For The Devil' as a tribute to Lemmy. The song was included as the final track on the band's last album 'Bad Magic' which was released in August 2015. Joe is pictured here in August 1986 with Lemmy at the Donington Monsters Of Rock Show. At the show Lemmy was responsible for ending the missile throwing by the crowd before Def Leppard took the stage for Rick's big comeback. Motorhead also played before Def Leppard again 20 years later in Milan, Italy on 3rd June 2006 at the Gods Of Metal festival. The first show of the YEAH! tour. Once again Ross Halfin was there and took this photo of Joe and Lemmy backstage. Joe had already played a Motorhead song during a show in September following news that the band had ended a show early due to Lemmy's health issues. Some members of Def Leppard sent video messages to his 70th birthday party which was celebrated on 13th December in Los Angeles. The event was detailed in this recent Rolling Stone article. Lemmy turned 70 on 24th December. 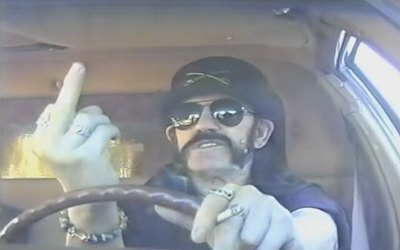 "Well I think we're all gonna have to show a little Sympathy For The Devil now that Lemmy has joined him. Sad news breaking this week of course that Lemmy Kilmister passed away at the age of 70 years old. But my god didn't he have a great run and didn't he leave us with a fantastic legacy. So I figured I'd play Sympathy For The Devil because, as Lemmy once said, when he dies he's gonna go to hell because that's where all the pool tables were." "He was a fantastic character. I had the great pleasure of hanging out with Lemmy a bunch of times. Backstage in Dublin. Out front at Thin Lizzy concerts on the Sunset Boulevard back in 2005 I think it was. And then going back to his apartment and him showing me his very intriguing collection of, how shall we put it, World War II memorabilia." "He was a lovely, lovely guy. He will be sadly missed and so there in celebration of all things Lemmy we just heard Motorhead from their latest album Bad Magic with their cover of the old Rolling Stones classic Sympathy For The Devil."